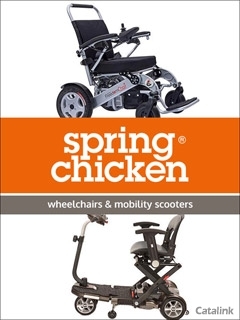 To order a printed copy of the Wheelchairs & Scooters by Spring Chicken catalogue, simply click the Request button below. Wheelchairs & Scooters that will make your life easier! At Spring Chicken, your health and mobility is a number one priority. Offering wheelchairs and mobility scooters that aim to make life easier, they truly have the products to suit you. Order a copy of the catalogue today to explore their full range! Their collection includes the most modern and well-designed products that are easy to use and super effective. Explore folding electric wheelchairs, rising power chairs, compact mobility scooters and so much more. Spring Chicken stock an exclusive range of wheelchairs, featuring the innovative Joy Rider Electric Powerchair that can reach up to 4mph and has a smooth folding mechanism to make life easier for you. If you're looking for a mobility scooter, they can help find the right one for you. As mobility scooter specialists, their highly trained team can speak with you to identify your needs and wants and find a scooter that is perfect for you. Feel free everyday with help from the team at Spring Chicken. Order your free copy of their catalogue today and explore all their fantastic products! Natures Best have been supplying high quality Vitamins, Mineral supplements and Herbs for over 27 years. All Natures Best products are manufactured in the UK to stringent pharmaceutical standards of Good Manufacturing Practice (GMP) and approved by the UK Department of Health. Simply Supplements provide a range of premium nutritional supplements at great value for money. As one of the UKs leading vitamin suppliers, they sell over 170 popular products such as Glucosamine, Fish Oils, Multivitamins, Echinacea, and many more through their website. Welcome to the home of smart ideas for serious readers. Youll find purpose built reading lights that allow you to read for longer and in more comfort. Their Easy Book Clips free up both your hands when cooking or working at your computer. Or why not treat yourself to a magnifier or some reading glasses. HSL Chairs offer a range of recline and raise chairs, recliners, armchairs, swivel chairs and sofas. Every chair is designed to fit you perfectly providing maximum postural support. By pressing the Request Printed Catalogue button you give consent to Wheelchairs & Scooters by Spring Chicken (and their Data Processors for the specific purpose of delivering your literature) to send you their Catalogue.